This is a guest post by Liz Dore, Faculty Librarian for Science & Architecture, Glucksman Library, University of Limerick & Ronan Madden, Arts & Humanities Librarian, University College Cork Library. For those who haven’t attended before, ‘LILAC’ is the ‘Librarians Information Literacy Annual Conference’, organised by CILIP’s IL group in the UK. As you might expect, the focus is on information/digital literacies & information seeking. The conference this year was held at Sheffield Hallam University, right in the centre of Sheffield. It was held over 3 days, with 3 keynote speakers and 8 groups of parallel sessions (84 sessions in total). Over 330 delegates attended. There’s a lot going on at a conference like this, so if you are planning to attend at some stage (and the venue next year is Newcastle) our advice is to plan it in advance if possible. Pick some aspects of IL that you’re interested in, and look for those on the conference programme. It’s worth booking parallel sessions in advance too, as some of those fill up quickly. Bill Thompson explored the idea that the split now is between the technologists / coders V the users, and that ‘those who rule the bits, rule the world’. Applying this to libraries he suggested that if we, as librarians, are to claim that we are information or digitally literate, then we really need to understand technology. While we don’t all have to be coders/programmers, it is important to have an appreciation of code and a genuine interest in the information world e.g. who actually controls it. Of course Library/Faculty partnership was key. Now, based on their evidence, they are in the process of putting together their own IL Framework and a Library T&L strategy. This presentation from Alan Carbery was interesting because he spoke about how their library’s existing IL programme, which was embedded and based on inquiry-based learning, had to be abandoned when the university changed its curriculum. There were no longer any core modules into which they could embed their IL. They were forced to go back to the drawing-board and map all of the students and all of the courses. They realised they were no longer going to be able to reach all of the students for face-to-face sessions. Their main aim was to avoid a situation where some students would get no IL, so they decided to opt for a blended approach – where it was no longer possible to get to see students face-to-face they slotted their information literacy content into the VLE. They did so using videos to prompt online discussion, and he showed us an interesting example of how they did this for the subject of copyright. They found that students are very willing and able to engage in online discussion, and overall they feel that their new blended approach is richer than what they had originally been offering. This one really highlighted collaboration. It was co-presented by the Science Librarian and the ‘Effective Learning Tutor’. Together they worked with the academics to embed information and academic literacies within the science curriculum at the university. They had been using ‘Personal Development Profiles’ in a generic sense, outside of the core curriculum, without a lot of success until they embedded the PDPs, along with the key literacies and graduate attributes, within the faculty’s core ‘scientific investigation’ courses. Both the science librarian and the effective learning tutor taught sessions for these courses, for which the students were required to write essays as well as reflect on their learning in their e-portfolios. The key literacies included in the courses were information searching, referencing, academic writing & reflective learning. Overall, what they had managed to do together, working with the relevant academics, was to knit the graduate attributes to the learning outcomes of these courses, which were assessed by way of the essays and the e-portfolios. ‘Off to a Flying Start’ was about supporting student transition. With academic colleagues the library developed an online interactive resource to address the transition from school to university. Initially the resource was rolled out to 11 schools and by 2013 it had reached 34 schools. The content is both generic & subject specific. The information is sent to students as soon as they are accepted into a course. This example shows the section on being an independent learner, with students speaking at the top of the page and a member of the department in the second half. They conducted surveys to assess the effectiveness of the resource. Initially new students are most concerned with finance and settling in to University. Becoming an independent learner & coping academically became a concern once they had settled in. Students get an overwhelming amount of information at the beginning and in many cases don’t retain a lot of it. Students liked to hear and see direct experiences from other students. Independent learning and referencing aspects were popular. They also expressed a preference for interactive activities, local/practical information and suggested that to examine a day/week in the life of a student might be helpful. Students liked the videos and the visual elements of the resource. Recommendations for supporting transition include: circulate information using a ‘drip feed’ approach, promote through all available channels, use content that is ‘fun’, engaging and light, and keep the content available throughout the year because as students settle in their priorities change and they understand the context better. The tone & level is important – it can be useful to have other students deliver content where appropriate. Alison Head is the director of Project Information Literacy, a series of research studies carried out in the US on how students study and conduct research and what it is like to be a student in the digital age – it is the biggest study undertaken in information literacy. •Library is seen as ‘a refuge’ (but not necessarily a place to ask for help with research). Based on the above she suggests that libraries need to offer proactive information services (not just at a reference desk) and also continue to embed IL in courses. She believes that being able to evaluate information for quality is a key 21st century competency. The focus was on exploring the role of student ambassadors and how they can become involved in promoting digital literacy and assisting the development of best practice in embedding within the curriculum. This was a collaborative project involving teaching and learning, the Library and IT. Ten students from two departments were recruited (using tweets, call outs in class, through the VLE). They were called ‘Student Ambassadors for Digital Literacy’. Some of the reward incentives were Amazon vouchers and Mozilla online badges. Four ‘workshops’ were arranged to discuss four themes: searching, reading & writing, managing & sharing, the digital footprint. One of the findings which emerged was that the notion of the ‘digital native’ is meaningless. Students are individuals and each adopts their own individual information strategies. They interweave assignment work with other online activity. This works builds on previous work at LSE such as the development of their ‘Digital & Information Literacy Framework’, and a ‘Teaching, Learning & Assessment Committee report’. They hope to continue working with ‘SADLs’, but with a clearer expectation for their role, and the requirements for the workshops. The ‘ID&AL Loop’ is about how assessment feedback can encourage students to attend Information, Digital and Academic Literacy generic workshops. Lecturers require students to attend the workshops based on the standard of their first year assignments i.e. they return the essay ‘prescribing’ attendance if they feel it is required (so it goes beyond induction). They are also widely advertised on campus and held in February, and again in April. Booking was through LibGuides. The sessions included study skills, library topics and IT skills. They were also advertised widely on-campus as ‘Get a Better Grade’ workshops, and then later in April as ‘Keep Calm and Pass Your Exams’. Timing was important, with February proving to be the right choice for them. These workshops are in addition to generic and subject-specific sessions that are run for new students in October. They plan to make more of the workshop material available on-line to cater for their distance learners. They are also considering using open badges to encourage attendance. The overriding advantage to the Library is that it is seen as an academic partner in terms of feedback across the university. Major Themes from LILAC 2014? 2. Transition and induction: how much information is the right amount? – important to get it right, and also how much should be online/blended or face-to-face? 3. Embedding: still best practice to embed within core subject modules linked with assessment. Generic IL sessions (aside from induction/transition) can serve a useful ‘remedial’ purpose. 4. Buy-in: libraries can achieve this by linking digital & information literacies with graduate attributes, student retention and employability at College/Faculty and University level. 5. Evidence of impact strengthens the case. Back in 2012, Thomas Reinsfelder suggested that students exposed to a one-on-one consultation with a research librarian after writing a first draft will show a greater improvement in the quality of sources used on the final paper than students who did not meet with a librarian. This statement is based on the premise that personal research consultations that include the analysis and progressive monitoring of citations can be quite effective in improving the qualitative outcome of continuous assessments produced by undergraduate students. The rationale here is straight forward. Individual meetings allow for greater attention to detail, consideration of specific academic needs and the ability to address students’ assignment focused concerns. Librarians have a unique learning opportunity here as they can find out about how students select and use information sources. They can also monitor and review the progression of individual works, i.e. from initial assignment draft to final product. The citation analysis element focuses on the quality and appropriateness of sources cited – rather than type and/or format – within the context of a student’s early draft paper and the final pre-submission version. It is difficult to quantitatively measure the effectiveness and impact of research consultations enjoyed by individual students. For example, Donegan (cited in Reinsfelder, 2012) compared test results and identified little difference in the research skills displayed by students who received individual research support vis-à-vis those who merely availed of group based instruction. Others (Gale and Evans; Williamson, Blocker, and Gray cited in Reinsfelder, 2012) note that individual research consultations were perceived as a positive and effective library service. Importantly, another study notes that citation analysis is a useful design element in library instruction programmes, as it alerts librarians of the number of citations in student papers (representing effort) and the types of sources used (indicating quality), especially those requiring use of library resources and research tools (Hovde, cited in Reinsfelder, 2012). It is important to identify adequate criteria and a solid process for rating the quality of an assignment bibliography presented by a student. Through the ‘objective’ measurement of a draft paper, one hopes to improve the quality and appropriateness of information sources used in the final version. Common measures include 1] quantity of sources, 2] format or type of source (digital/analogue; grey literature, journals, monographs), 3] currency, 4] variety, 5] relevance to the topic under discussion, 6] authority/legitimacy/quality of information used (e.g. based on the idea of quality on the reputation of the source, i.e. publisher and author; scholarly vs. popular), 7] consistency in citation formatting. It is important to consider that the development for any type of assessment scale requires considerable time and effort. When applied in the field, ‘objective’ rating scale measurements are coloured by individuals’ (subjective) assessments. This, in turn, can lead to incongruous outcomes when applied on scale for validity and reliability testing. Consequently, continuous scale variables fine-tuning and re-assessment is required to ensure successful application (see e.g. the efforts made on behalf of the READ Scale and Project SAILS). 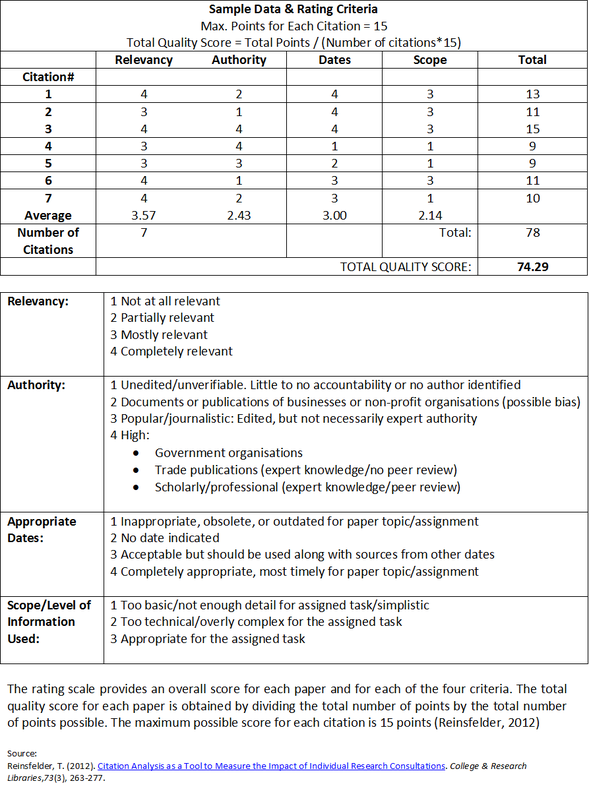 The good news is that in the analysis of this rating scale scenario, one-on-one consultations with a librarian during the paper writing process did result in sources of higher quality being used on the final paper than on the draft paper. The comparison of relevant test results, through the application of the above rating scale, noted a significant statistical difference. Crucially, no statistical significant difference was noted in the quality of sources used in draft and final papers of students (the control group) who did not enjoy a consultation (one might even use the horrible phrase "an intervention...") with a librarian. Faculty who supported this project noted that students who enjoyed a one-on-one research consultation with a librarian improved the ultimate outcome on their work significantly. In particular, students developed a better understanding of the different types of sources out there and their appropriate use within the academic research/writing context. Another interesting perception was that students were encouraged to develop new ways of thinking about research assignments. The bottom line is that strategic partnering up with the library for assistance and expertise is a no-brainer approach in aiding faculty and student success. The use of rating scales (in this case for rating the quality of sources used by students) can be helpful in measuring and evidencing the success of such partnerships. However, the establishment of such a service necessitates that expectations are carefully managed and calibrated. Research consultations are time and energy consuming for library staff. It is also important to state that not every student on campus can avail of such a focused service due to obvious staffing constraints. Reinsfelder, T. (2012). Citation Analysis as a Tool to Measure the Impact of Individual Research Consultations. College & Research Libraries,73(3), 263-277. Mackey, T. P., & Jacobson, T. (2010). Collaborative information literacy assessments: Strategies for evaluating teaching and learning. New York: Neal-Schuman Publishers, Inc.